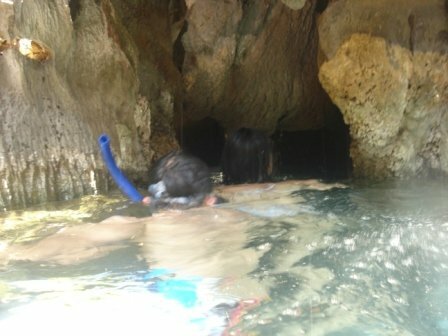 This opening is through a cave in Kayangan Lake in Coron, Palawan. It was eerie going into the cave but in we went nevertheless. I think D2 has some pictures of when we were inside the cave but up to now she has not uploaded them. My girls all got sunburned in the hot Palawan sun. They used sunblock alright but they were not faithful in re-applying the stuff. I used sunblock with an SPF 70. I re-applied the gooey substance every 2 hours or so. The result? I got darker but didn't burn. The thing is, I think I have more fine lines around my eyes. Too much squinting? Nah... just old age. I heard there's a great wrinkle treatment program that uses a cream with prototype 37c. Whatever that is, I think I'd better take a look. No harm doing.